136 (mit B. H. Matzat): Inverse Galois Theory. 2nd Edition. Springer Verlag (2018), xvii + 533 pp., (MR3822366). 108 (mit M. Broué, J. Michel): Split Spetses for Primitive Reflection Groups. Astérisque 359 (2014), vi + 146 pp., (MR3221618). 95 (mit D. Testerman): Linear Algebraic Groups and Finite Groups of Lie Type. Cambridge University Press (2011), xv + 309 pp., (MR 2012i:20058) errata. 44 (mit B. H. Matzat): Inverse Galois Theory. Springer Verlag (1999), xv + 436 pp., (ZB 940.12001). 139 Bounding Harish-Chandra series. (mit O. Dudas) Trans. Amer. Math. Soc. 371 (2019), 6511-6530, (). 138 Even degree characters in principal blocks. (mit E. Giannelli, C. Vallejo) J. Pure Appl. Algebra 223 (2019), 900-907, (MR3850575). 137 On a minimal counterexample to Brauer's k(B)-conjecture. Israel J. Math. 228 (2018), 527-556, (MR3874852). 135 Modular irreducibility of cuspidal unipotent characters. (mit O. Dudas) Invent. Math. 211 (2018), 579-589, (MR3748314). 134 On blocks with one modular character. 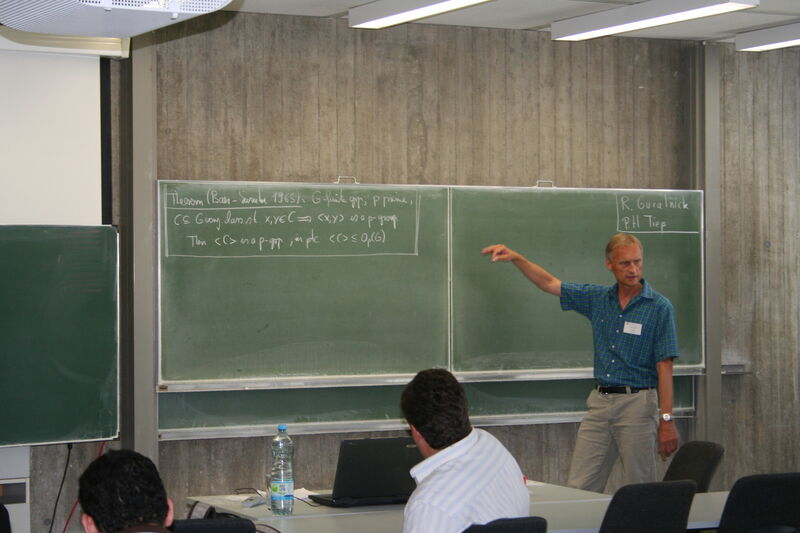 (mit G. Navarro, B. Späth) Forum Math. 30 (2018), 57-73, (MR3739327). 133 Cuspidal characters and automorphisms. Advances Math. 320 (2017), 887-903, (MR3690344). 132 A generalisation of a theorem of Wielandt. (mit F. Fumagalli) J. Algebra 490 (2017), 474-492, (MR3690344). 131 On defects of characters and decomposition numbers. (mit G. Navarro, B. Sambale) Algebra Number Theory 11 (2017), 1357-1384, (MR3687100). 130 Reliability and reproducibility of Atlas information. (mit T. Breuer, E. O'Brien) In: Finite Simple Groups: Thirty Years of the Atlas and Beyond. Amer. Math. Soc., Providence (2017), 21-31, (MR3682588). 129 Defect zero characters predicted by local structure. (mit G. Navarro, G. Robinson) Bull. London Math. Soc. 49 (2017), 443-448, (MR3723629). 128 On the number of simple modules in a block of a finite group. (mit G. Robinson) J. Algebra 475 (2017), 423-438, (MR3612478). 127 Brauer's height zero conjecture for quasi-simple groups. (mit R. Kessar) J. Algebra 475 (2017), 43-60, (MR3612463). 126 Local-global conjectures in the representation theory of finite groups. In: Representation theory - current trends and perspectives. Eur. Math. Soc., Zürich (2017), 519-539, (MR3644803) talk. 125 Characters of odd degree. (mit B. Späth) Ann. of Math. (2) 184 (2016), 869-908, (MR3549625). 124 A Murnaghan-Nakayama rule for values of unipotent characters in classical groups. (mit F. Lübeck) Represent. Theory 20 (2016), 139-161, Corrigendum: ibid. 21 (2017), 1-3, (MR3466537). 123 Simple endotrivial modules for quasi-simple groups. (mit C. Lassueur, E. Schulte) J. reine angew. Math. 712 (2016), 141-174, (MR3466551). 122 On the number of p'-degree characters in a finite group. (mit A. Maróti) Int. Math. Res. Not. 20 (2016), 6118-6132, (MR3579960). 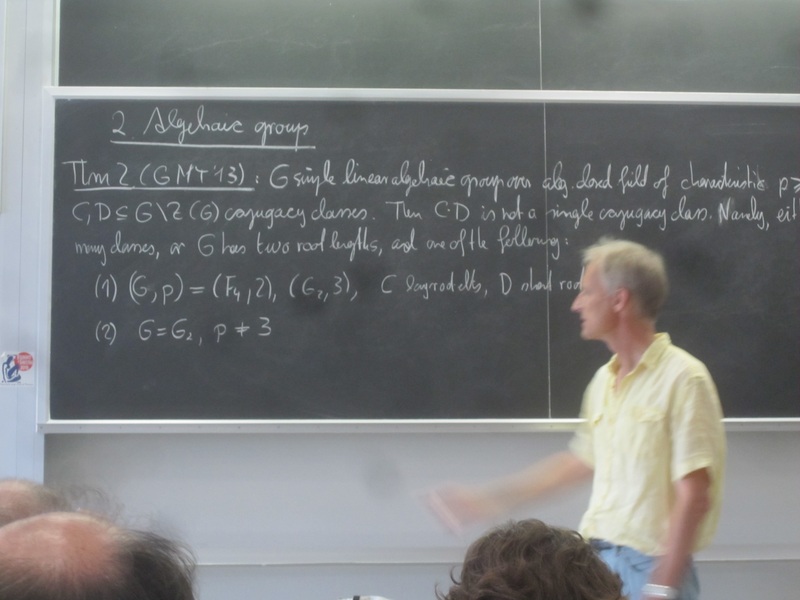 121 Nilpotent and abelian Hall subgroups in finite groups. (mit A. Beltrán, M. Felipe, A. Moretó, G. Navarro, L. Sanus, R. Solomon, P.H. Tiep) Trans. Amer. Math. Soc. 368 (2016), 2497-2513, (MR3449246). 120 Decomposition matrices for exceptional groups at d=4. (mit O. Dudas) J. Pure Appl. Algebra. 220 (2016), 1096-1121, (MR3414409). 119 Lusztig induction and l-blocks of finite reductive groups. (mit R. Kessar) Pacific J. Math. 279 (2015), 267-296, (MR3437779). 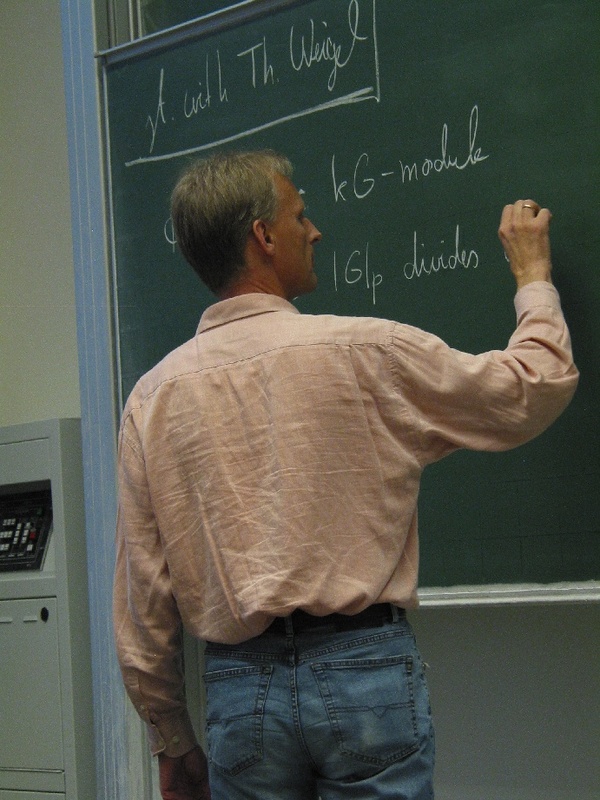 118 Simple endotrivial modules for linear, unitary and exceptional groups. (mit C. Lassueur) Math. Z. 280 (2015), 1047-1074, (MR3369366) talk. 117 Invariant blocks under coprime actions. (mit G. Navarro, B. Späth) Doc. Math. 20 (2015), 491-506, (MR3477914). 116 Decomposition matrices for low rank unitary groups. (mit O. Dudas) Proc. London Math. Soc. 110 (2015), 1517-1557, (MR3356813). 115 A class group heuristic based on the distribution of 1-eigenspaces in matrix groups. (mit M. Adam) J. Number Theory 149 (2015), 225-235, (MR3296009). 114 Variations on the Baer-Suzuki theorem. (mit R. M. Guralnick) Math. Z. 279 (2015), 981-1006, (MR3318256). 113 Products and commutators of classes in algebraic groups. (mit R. M. Guralnick) Math. Ann. 362 (2015), 743-771, (MR3368081) talk. 112 Characters of positive height in blocks of finite quasi-simple groups. (mit O. Brunat) Int. Math. Res. Not. 17 (2015), 7763-7786, (MR3404000 ). 111 Rational rigidity for E8(p). (mit R. M. Guralnick) Compositio Math. 150 (2014), 1679-1702, (MR3269463). 110 The proof of Ore's conjecture [after Ellers-Gordeev and Liebeck-O'Brien-Shalev-Tiep]. Sém. Bourbaki, Astérisque 361 (2014), Exp. 1069, 325-348, (MR3289286) talk. 109 Projective modules in the intersection cohomology of Deligne-Lusztig varieties. (mit O. Dudas) C. R. Acad. Sci. Paris Sér. I Math. 352 (2014), 467-471, (MR3210126). 107 On the inductive Alperin-McKay and Alperin weight conjecture for groups with abelian Sylow subgroups. J. Algebra 397 (2014), 190-208, (MR3119221) talk. 106 Frobenius-Schur indicators of unipotent characters and the twisted involution module. (mit M. Geck) Represent. Theory 17 (2013), 180-198, (MR3037782). 105 Quasi-isolated blocks and Brauer's height zero conjecture. (mit R. Kessar) Ann. of Math. (2) 178 (2013), 321-384, (MR3043583). 104 Products of conjugacy classes in finite and algebraic simple groups. (mit R. M. Guralnick, P.H. Tiep) Advances Math. 234 (2013), 618-652, (MR3003939), talk. 103 The largest irreducible representations of simple groups. (mit M. Larsen, P.H. Tiep) Proc. London Math. Soc. 106 (2013), 65-96, (MR3020739), talk. 102 Characteristic polynomials and fixed spaces of semisimple elements. (mit R. M. Guralnick) Proc. Symp. Pure Math. 86 (2012), 173-186, (MR2977003). 101 The finite groups with no real p-elements. (mit S. Dolfi, G. Navarro) Israel J. Math. 192 (2012), 831-840, (MR3009744). 100 Characterizing normal Sylow p-subgroups by character degrees. (mit G. Navarro) J. Algebra 370 (2012), 402-406, (MR2966846). 99 Simple groups admit Beauville structures. (mit R. M. Guralnick) J. London Math. Soc. 85 (2012), 694-721, (MR2927804). 98 Products of conjugacy classes and fixed point spaces. (mit R. M. Guralnick) J. Amer. Math. Soc. 25 (2012), 77-121, (MR2833479). 97 Extending characters from Hall subgroups. (mit G. Navarro) Doc. Math. 16 (2011), 901-919, (MR2880677). 96 Blocks with equal height zero degrees. (mit G. Navarro) Trans. Amer. Math. Soc. 363 (2011), 6647-6669, (MR 2012g:20016). 94 On the distribution of class groups of number fields. Experiment. Math. 19 (2010), 465-474, (MR 2011m:11224). 93 Constructing representations of Hecke algebras for complex reflection groups. (mit J. Michel) LMS J. of Comput. and Math. 13 (2010), 426-450, (MR 2012c:20006). 92 Zeros of Brauer characters and the defect zero graph. J. Group Theory 13 (2010), 171-187, (MR 2011c:20016). 91 Cohen-Lenstra heuristic and roots of unity. J. Number Theory 128 (2008), 2823-2835, (MR 2009j:11179). 90 Extensions of unipotent characters and the inductive McKay condition. J. Algebra 320 (2008), 2963-2980, (MR 2009e:20028). 89 Finite groups with minimal 1-PIM. (mit Th. Weigel) Manuscripta Math. 126 (2008), 315-332, (MR 2009d:20013), talk. 88 The inductive McKay condition for simple groups not of Lie type. Comm. Algebra 36 (2008), 455-463, (MR 2009a:20012). 87 Height 0 characters of finite groups of Lie type. Represent. Theory 11 (2007), 192-220, (MR 2008m:20025), talk. 86 Nondivisibility among character degrees II: Nonsolvable groups. (mit A. Moretó) J. London Math. Soc. 76 (2007), 667-682, (MR 2008j:20017). 85 A dual version of Huppert's rho-sigma conjecture. (mit A. Moretó) Int. Math. Res. Not. 22 (2007), 14 pp, (MR 2008k:20013). 84 A reduction theorem for the McKay conjecture. (mit M. Isaacs, G. Navarro) Invent. Math. 170 (2007), 33-101, (MR 2008h:20016). 83 The 2F-modules for nearly simple groups. (mit R. M. Guralnick, R. Lawther) J. Algebra 307 (2007), 643-676, (MR 2007k:20098). 82 Inequalities for some blocks of finite groups. (mit G. Navarro) Archiv Math. 87 (2006), 390-399, (ZB 1109.20011). 81 The totally real primitive number fields of discriminant at most 109. In: ANTS 2006, LNCS 4076. Springer, Berlin Heidelberg (2006), 114-123, (MR 2007j:11179). 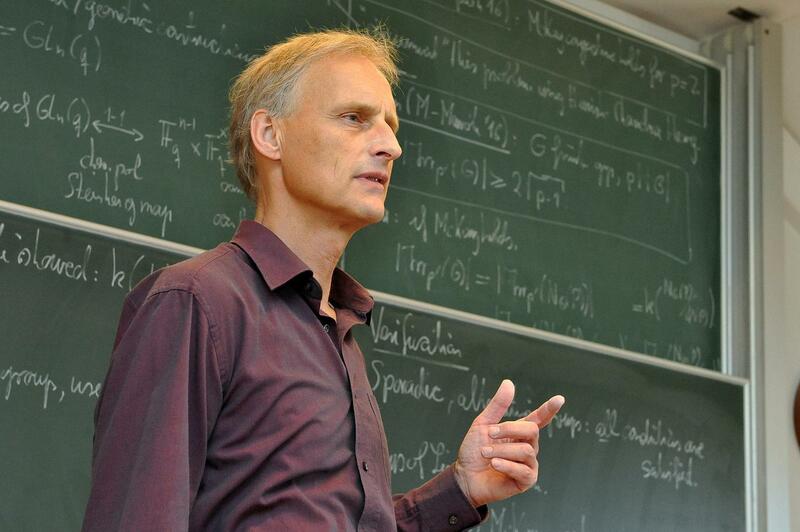 80 Splitting fields for extended complex reflection groups and Hecke algebras. Transform. Groups 11 (2006), 195-216, (MR 2007h:20037). 79 Fast-einfache Gruppen mit langen Bahnen in absolut irreduzibler Operation. J. Algebra 300 (2006), 655-672, (MR 2007f:20030). 78 Reflection groups. (mit M. Geck) In: Handbook of Algebra, vol. 4. Elsevier (2006), 337-383, (MR 2011c:20069). 77 Separating characters by blocks. 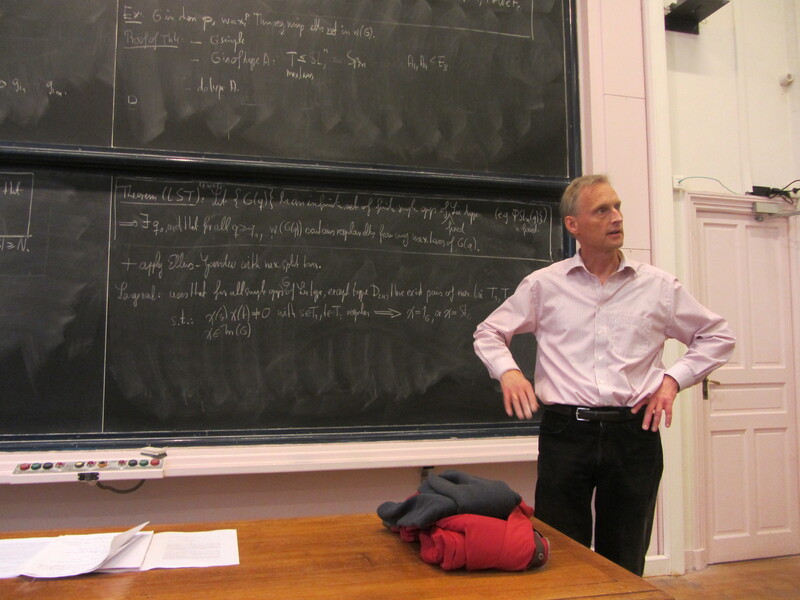 (mit C. Bessenrodt, J.B. Olsson) J. London Math. Soc. 73 (2006), 493-505, (MR 2007b:20016). 76 Element orders and Sylow structure of finite groups. (mit A. Moretó, G. Navarro) Math. Z. 252 (2006), 223-230, (MR 2006m:20026). 75 Nonsolvable groups with few character degrees. 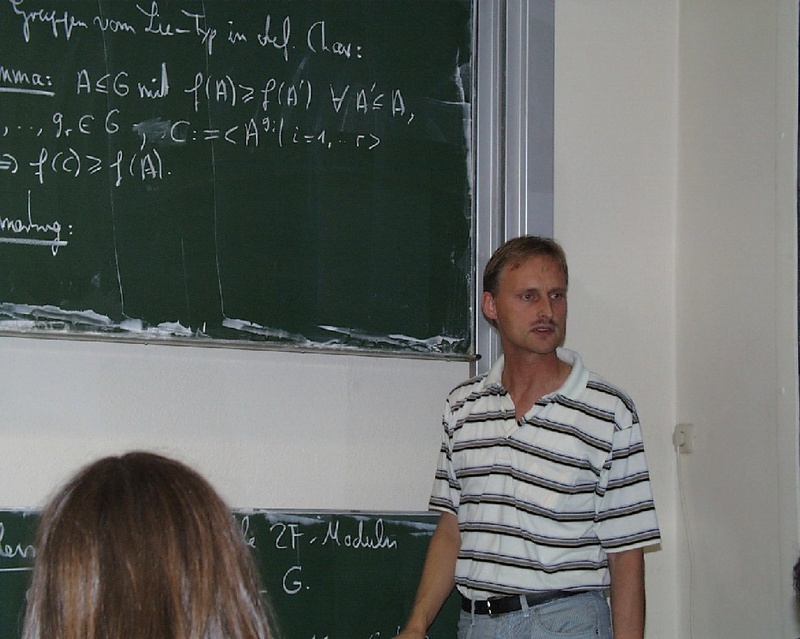 (mit A. Moretó) J. Algebra 294 (2005), 117-126, (MR 2006g:20015). 74 Springer correspondence for disconnected exceptional groups. Bull. London Math. Soc. 37 (2005), 391-398, (MR 2005k:20109). 73 Number fields with discriminant ± 2a 3b and Galois group An or Sn. (mit D. P. Roberts) LMS J. of Comput. and Math. 8 (2005), 80-101, (MR 2006a:11137). 72 Classification of 2F-modules, II. (mit R. M. Guralnick) In: Finite Groups 2003. de Gruyter, Berlin, New York (2004), 117-183, (MR 2006b:20062). 71 Counting nilpotent Galois extensions. (mit J. Klüners) J. reine angew. Math. 572 (2004), 1-26, (MR 2005f:11259). 70 Real characters of p'-degree. (mit I. M. Isaacs, G. Navarro) J. Algebra 278 (2004), 611-620, (MR 2005f:20016), talk. 69 On the distribution of Galois groups II. Experiment. Math. 13 (2004), 129-135, (MR 2005g:11216). 68 Self-normalizing Sylow subgroups. (mit R. M. Guralnick, G. Navarro) Proc. Amer. Math. Soc. 132 (2004), 973-979, (MR 2004m:20043). 67 Springer correspondence for disconnected groups. (mit K. Sorlin) Math. Z. 246 (2004), 291-319, (MR 2004k:20087). 66 Explicit realization of the Dickson groups G2(q) as Galois groups. Pacific J. Math. 212 (2003), 157-167, (MR 2004i:12006). 65 Familles de caractères de groupes de réflexions complexes. (mit R. Rouquier) Represent. Theory 7 (2003), 610-640, (MR 2004j:20009). 64 Fourier transforms and Frobenius eigenvalues for finite Coxeter groups. 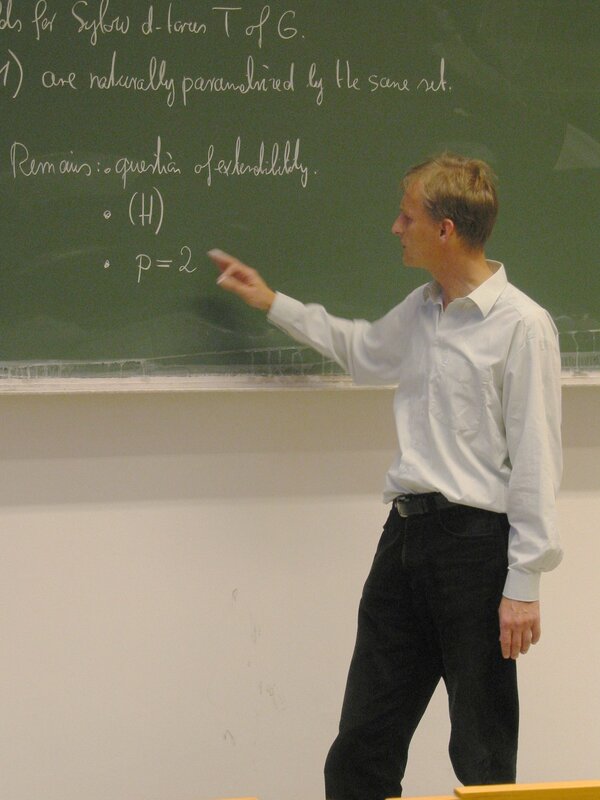 (mit M. Geck) J. Algebra 260 (2003), 162-193, (MR 2005d:20067). 63 Classification of 2F-modules, I. (mit R. M. Guralnick) J. Algebra 257 (2002), 348-372, (MR 2003m:20008), talk. 62 On the distribution of Galois groups. J. Number Theory 92 (2002), 315-329, (MR 2002k:12010). 61 Irreducibility of tensor squares, symmetric squares and alternating squares. (mit K. Magaard, P. H. Tiep) Pacific J. Math. 202 (2002), 379-427, (MR 2002m:20025). 60 A database of invariant rings. (mit G. Kemper, E. Körding, B. H. Matzat, D. Vogel, G. Wiese) Experiment. Math. 10 (2001), 537-542, (MR 2002k:13011). 59 Prime power degree representations of quasi-simple groups. (mit A. E. Zalesskii) Archiv Math. 77 (2001), 461-468, (MR 2002j:20016). 58 A database for field extensions of the rationals. 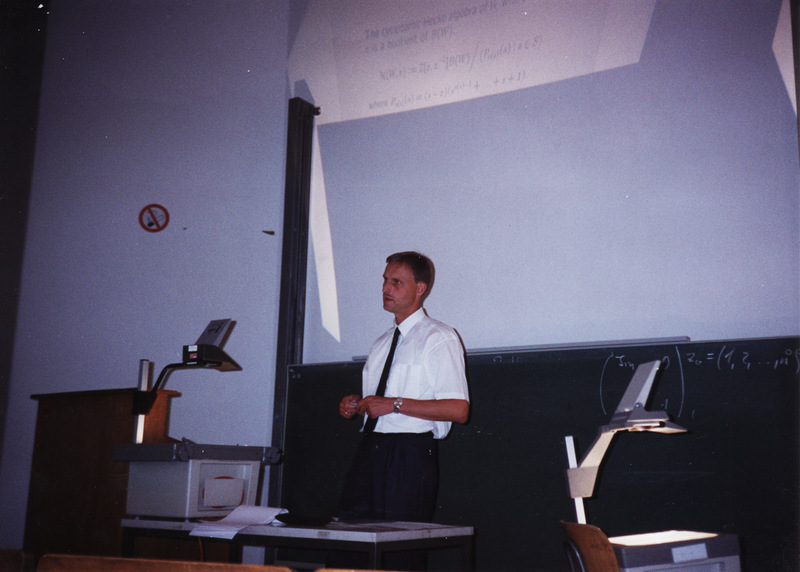 (mit J. Klüners) LMS J. of Comput. and Math. 4 (2001), 182-196, (MR 2003i:11184). 57 Low-dimensional representations of quasi-simple groups. (mit G. Hiss) LMS J. of Comput. and Math. 4 (2001), 22-63, Corrigenda: ibid.5 (2002), 95-126, (MR 2002b:20015). 56 Low-dimensional representations of special unitary groups. (mit G. Hiss) J. Algebra 236 (2001), 745-767, (MR 2001m:20019). 55 Multi-parameter polynomials with given Galois group. J. Symbolic Comput. 30 (2000), 717-731, (MR 2002a:12007). 54 Explicit Galois realization of transitive groups of degree up to 15. (mit J. Klüners) J. Symbolic Comput. 30 (2000), 675-716, (MR 2001i:12005). 53 Weights of Markov traces and generic degrees. (mit M. Geck, L. Iancu) Indag. Mathem. 11 (2000), 379-397, (MR 2003b:20009). 52 Zeros of characters of finite groups. (mit G. Navarro, J.B. Olsson) J. Group Theory 3 (2000), 353-368, (MR 2001h:20008). 51 On the generic degrees of cyclotomic algebras. Represent. Theory 4 (2000), 342-369, (MR 2002a:20005). 50 On the existence of a unipotent support for the irreducible characters of a finite group of Lie type. (mit M. Geck) Trans. Amer. Math. Soc. 352 (2000), 429-456, (MR 2000c:20064). 49 On the rationality and fake degrees of characters of cyclotomic algebras. J. Math. Sci. Univ. Tokyo 6 (1999), 647-677, (MR 2001e:20008). 48 Invariant fields of finite irreducible reflection groups. (mit G. Kemper) Math. Ann. 315 (1999), 569-586, (MR 2001c:13006). 47 On special pieces in the unipotent variety. (mit M. Geck) Experiment. Math. 8 (1999), 281-290, (MR 2000j:20083). 46 Towards spetses I. (mit M. Broué, J. Michel) Transform. Groups 4 (1999), 157-218, (MR 2001b:20082). 45 (2, 3)-generation of exceptional groups. 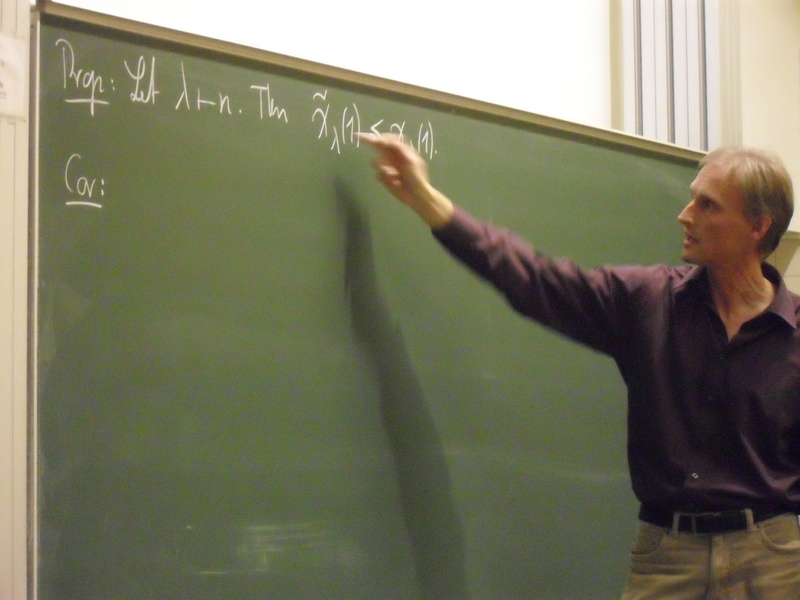 (mit F. Lübeck) J. London Math. Soc. 59 (1999), 109-122, (MR 2000e:20030). 43 Almost irreducible tensor squares. Comm. Algebra 27 (1999), 1033-1051, (MR 99m:20007). 42 Invariant rings and fields of finite groups. (mit G. Kemper) In: Algorithmic algebra and number theory. Springer, Berlin (1999), 265-281, (MR 99m:13010). 41 Representations of Hecke algebras and finite groups of Lie type. (mit R. Dipper, M. Geck, G. Hiss) In: Algorithmic algebra and number theory. Springer, Berlin (1999), 331-378, (MR 2000a:20023). 40 Generalized Harish-Chandra theory. (mit M. Broué) In: Representations of reductive groups. Cambridge University Press, Cambridge (1998), 85-103, (MR 2000k:20063). 39 Root systems and length functions. (mit K. Bremke) Geom. Dedicata 72 (1998), 83-97, (MR 99g:20075). 38 Spetses. Doc. Math., Extra Volume ICM II (1998), 87-96, (MR 99m:20090), talk. 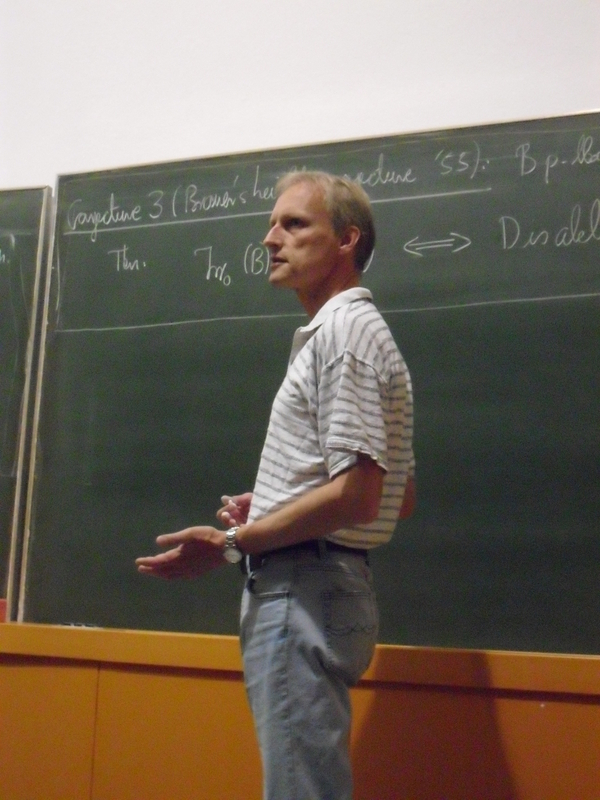 37 Complex reflection groups, braid groups, Hecke algebras. (mit M. Broué, R. Rouquier) J. reine angew. Math. 500 (1998), 127-190, (MR 99m:20088). 36 Symmetric cyclotomic Hecke algebras. (mit A. Mathas) J. Algebra 205 (1998), 275-293, (MR 99g:20026). 35 Irreducibility of alternating and symmetric squares. (mit K. Magaard) Manuscripta Math. 95 (1998), 169-180, (MR 99a:20011). 34 Reduced words and a length function for G(e, 1, n,). (mit K. Bremke) Indag. Mathem. 8 (1997), 453-469, (MR 99d:20062). 33 The finite irreducible linear groups with polynomial ring of invariants. (mit G. Kemper) Transform. Groups 2 (1997), 57-89, (MR 98a:13012). 32 Degrés relatifs des algèbres cyclotomiques associées aux groupes de réflexions complexes de dimension deux. In: Finite reductive groups: related structures and representations. Progr. Math. 141, Birkhäuser, Basel (1997), 311-332, (MR 98h:20019). 31 Covering groups of almost simple groups as Galois groups over Qab(t). (mit J. Sonn) Israel J. Math. 96 (1996), 431-444, (MR 97j:12003). 30 Presentations for crystallographic complex reflection groups. Transform. Groups 1 (1996), 259-277, (MR 98a:20053). 29 CHEVIE - A system for computing and processing generic character tables. (mit M. Geck, G. Hiss, F. Lübeck, G. Pfeiffer) AAECC 7 (1996), 175-210, (MR 99m:20017). 28 Towards a classification of the irreducible representations in non-describing characteristic of a finite group of Lie type. (mit M. Geck, G. Hiss) Math. Z. 221 (1996), 353-386, (MR 98a:20017). 27 GAR-Realisierungen klassischer Gruppen. Math. Ann. 304 (1996), 581-612, (MR 96k:12009). 26 Cuspidal unipotent classes and cuspidal Brauer characters. (mit M. Geck) J. London Math. Soc. 53 (1996), 63-78, (MR 97b:20013). 25 Unipotente Grade imprimitiver komplexer Spiegelungsgruppen. J. Algebra 177 (1995), 768-826, Translation by D. Craven, (MR 97a:20073). 24 On complex reflection groups and their associated braid groups. (mit M. Broué, R. Rouquier) In: Representations of groups. CMS Conf. Proc. 16, Amer. Math. Soc., Providence (1995), 1-13. 23 The Brauer trees of the exceptional Chevalley groups of type E6. (mit G. Hiss, F. Lübeck) Manuscripta Math. 87 (1995), 131-144, (MR 96c:20027). 22 Small rank exceptional Hurwitz groups. In: Groups of Lie type and their geometries. London Math. Soc. Lecture Notes 207, Cambridge Univ. Press, Cambridge (1995), 173-183, (MR 96b:20038). 21 Cuspidal unipotent Brauer characters. (mit M. Geck, G. Hiss) J. Algebra 168 (1994), 182-220, (MR 95i:20063). 20 Fields of definition of some three point ramified field extensions. In: The Grothendieck theory of dessins d'enfants. London Math. Soc. Lecture Notes 200, Cambridge Univ. Press, Cambridge (1994), 147-168, (MR 95m:11128). 19 Appendix: An exotic Fourier transform for H4. Duke J. Math. 73 (1994), 243-248, (MR 95c:20059). 18 Generation of classical groups. (mit J. Saxl, T. Weigel) Geom. Dedicata 49 (1994), 85-116, (MR 95c:20068). 17 Zyklotomische Heckealgebren. (mit M. Broué) Astérisque 212 (1993), 119-189, (mit einem Anhang von G. Lusztig). (MR 94m:20095). 16 Generic blocks of finite reductive groups. (mit M. Broué, J. Michel) Astérisque 212 (1993), 7-92, (MR 95d:20072). 15 Green functions for groups of types E6 and F4 in characteristic 2. Comm. Algebra 21 (1993), 747-798, (MR 94c:20077). 14 Generalized Deligne-Lusztig characters. J. Algebra 159 (1993), 64-97, (MR 94i:20025). 13 Polynome mit Galoisgruppen PGL2(p) und PSL2(p) über Q(t). Comm. Algebra 21 (1993), 511-526, (MR 94c:12007). 12 Disconnected groups of Lie type as Galois groups. J. reine angew. Math. 429 (1992), 161-182, (MR 93j:12005). 11 Théorèmes de Sylow génériques pour les groupes réductifs sur les corps finis. 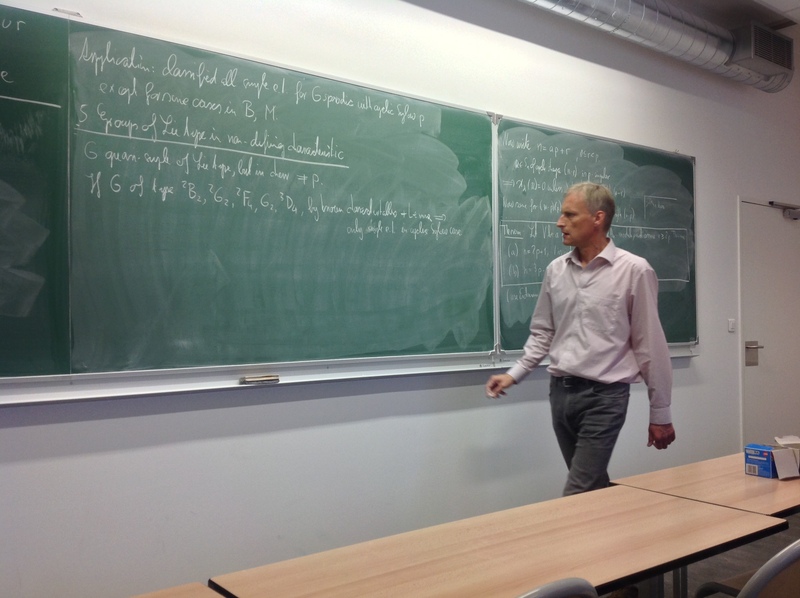 (mit M. Broué) Math. Ann. 292 (1992), 241-262, (MR 93a:20076). 10 Darstellungstheoretische Methoden bei der Realisierung einfacher Gruppen vom Lie Typ als Galoisgruppen. In: Representation theory of finite groups and finite dimensional algebras. Progr. Math. 95, Birkhäuser, Basel (1991), 443-459, (MR 93a:12005). 9 The maximal subgroups of 2F4(q2). J. Algebra 139 (1991), 52-69, (MR 92d:20068). 8 Genus zero translates of three point ramified Galois extensions. Manuscripta Math. 71 (1991), 97-111, (MR 92f:12009). 7 Hurwitz groups and G2(q). Canad. Math. Bull. 33 (1990), 349-357, (MR 91h:20049). 6 Die unipotenten Charaktere von 2F4(q2). Comm. Algebra 18 (1990), 2361-2381, (MR 91k:12015). 5 Some unitary groups as Galois groups over Q. J. Algebra 131 (1990), 476-482, (MR 91i:12004). 4 Exceptional groups of Lie type as Galois groups. J. reine angew. Math. 392 (1988), 70-109, (MR 89m:12004). 3 Polynomials with Galois groups Aut(M22), M22, and PSL3(F4).2 over Q. Math. Comp. 51 (1988), 761-768, (MR 90h:12008). 2 Polynomials for primitive nonsolvable permutation groups of degree d <= 15. J. Symbolic Comput. 4 (1987), 83-92, (MR 89b:12007). 1 Realisierung von Gruppen PSL2(Fp) als Galoisgruppen über Q. (mit B. H. Matzat) Math. Ann. 272 (1985), 549-565, (MR 87e:12002).